Here’s our fantasy premier league wildcard tips article where Yaniv activates his wildcard. He’s currently considering 3 options so help him choose by voting in the poll. Yaniv finished with an OR of 8k last season and is currently ranked 35k OR. So, it is on. WC is activated, I didn’t plan it at all, as I saved my FT for this GW but a disastrous GW for me said enough is enough. A poor score of 47 (3 less from average, but way less than active and serious managers) as we can see from the drop in my OR from 11k to 35k. I had 4 returns out of 11. 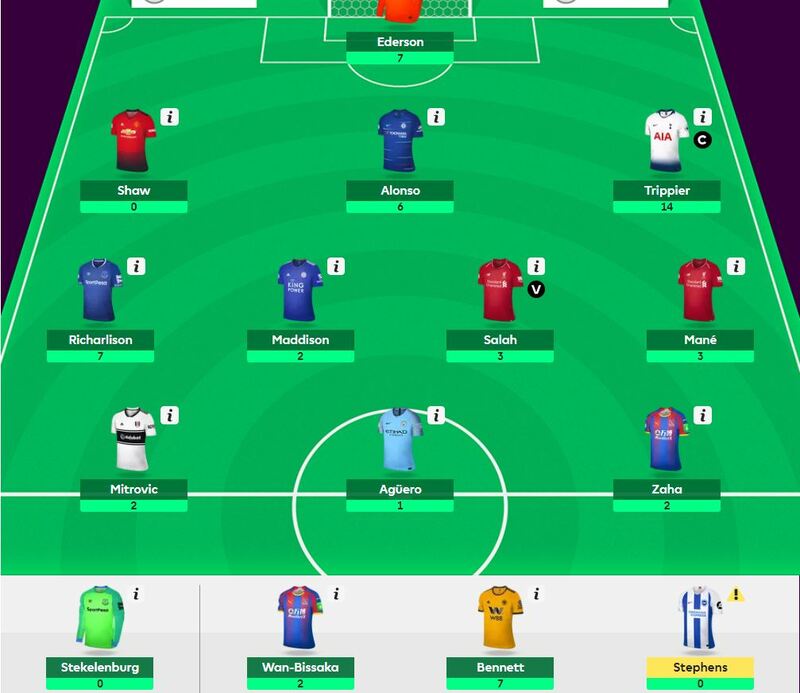 The only positive thing from the gameweek was that I choose Trippier with a clean sheet for Captain while Kane blanked. The others returners where Richarlison (as I expected) and 2 clean sheets from Alonso (no returns in attack during last 4 game weeks) and another “sad” clean sheet from Ederson. Sad as he played against my Liverpool attacking duo of Salah and Mane. Another blank for them and they’ve only returned 1 goal in their last 4 matches between them! While 1 player, you know who I am talking about, returns 5 goals and an assist during those 4 game weeks. Another problem I am facing is that my only premium fwd in Aguero is only playing only 60 minutes a game, and that is tough. This caused him not be on the field for what should have been his penalty kick yesterday. Shaw is part of hopeless United defence and he will have to go. After watching the Everton -Leicester match, I noticed Maddison is playing too deep for me and his underlying stats are not good for that reason. Zaha as I wrote before is playing very wide in a team that is out of shape, and he will definitely go out. 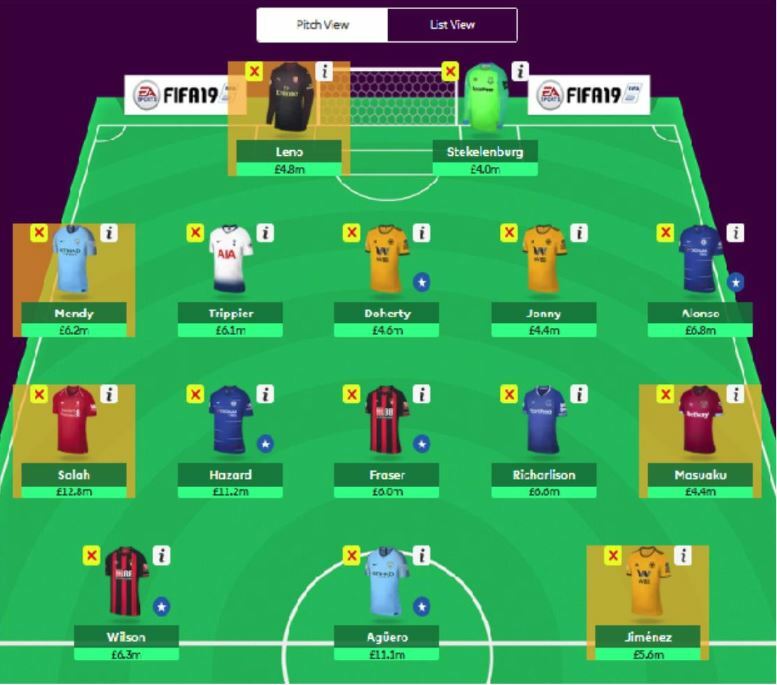 It’s worth noting that I have already made a number of changes so please look at the team in it’s entirety rather than just focusing on the players who show as being transferred in. 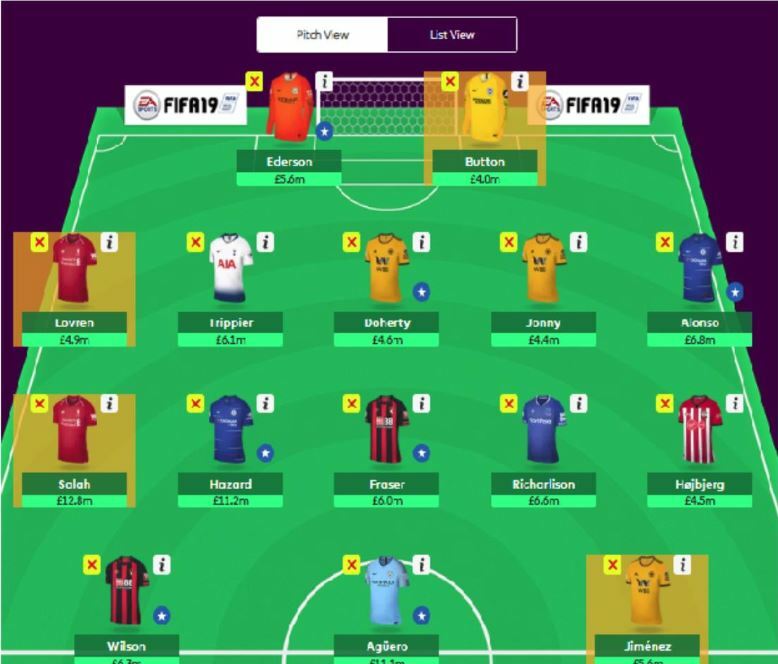 I have 3 WC options I’m considering within my TV of £102.2 m. There’s a poll at the end and any feedback in the comments section below is appreciated. I’m keeping my premium GK Ederson who is the current top GK points scorer. He proved yesterday that he can get a clean sheet any day any place. Button is the £4.0m non-playing GK reserve. Alonso, who I just wrote about, hasn’t returned in attack in the last 4 games. Hopefully he will reverse this. Trippier (nothing needed to explain about this guy) are my 2 premium defenders. I just wrote last week that it is a shame I didn’t have the extra 0.3m to bring Doherty over Bennett. Not having Doherty was the other reason, apart from Hazard, that I dropped in my OR. To make matters worse I put Bennett on the subs bench. I also wrote that Wolves are playing like “top 7” team. In defence at the moment they are playing like a “top 4” team and for their price bracket, £4.6m yesterday for Doherty and £4.4m for Jonny, I will get both of them for Shaw and Bennett. AWB is excellent cheap defender and has got me twice maximum bonus points, but with Palace’s run of fixtures I can’t see them bringing home a clean sheet in the next 5 games (4 of them against top 6 sides). Therefore I see no point in keeping him and it will be Lovren (who got maximum bonus yesterday in his first match of the season), who is very cheap for a starter in the best defence in the league right now. They also have good fixtures and I think he will get most of the games after missing almost 2 months. Originally I wanted to bring TTA but after he was benched yesterday and after Lovren’s performance, I changed my plan. 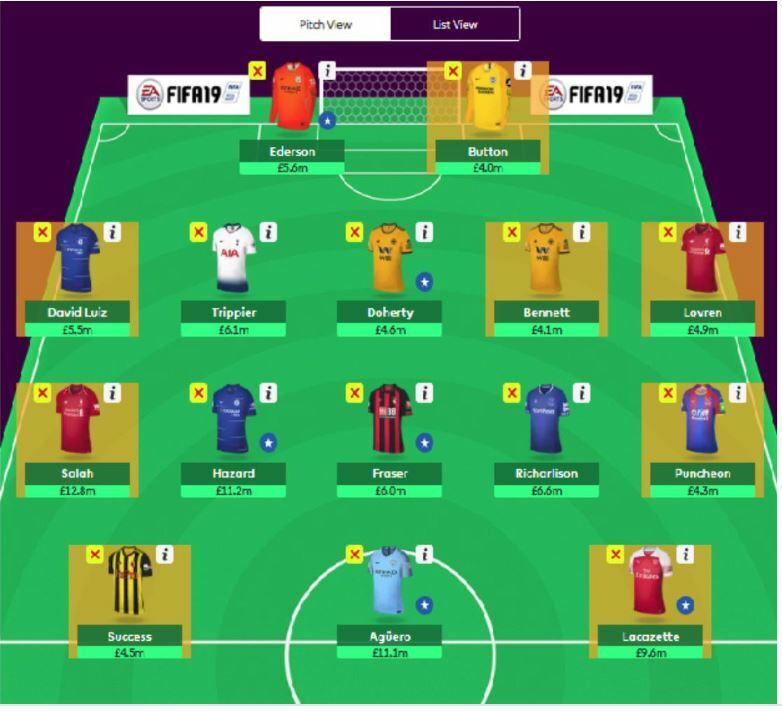 So it is never too late to join the train, after yesterday I had thoughts to quit FPL for this year (I really can’t do it because I am addicted to this game), and Hazard is the first one in my midfield. He is last year’s Salah, playing brilliant football and more importantly producing returns and fixtures are irrelevant. He comes in at the price of £11.2m (today it’s £11.3m) so welcome Eden. BTW a small story about my friend ,who is one of the best FPL players in Israel. He has finished inside the top 20k in 5 of the last 6 years. He insisted 3 years ago, in Leicester’s title winning season, that he wouldn’t bring Mahrez into is team because his returns weren’t sustainable. He finished that season 486k OR (the only year he was missing the top 20k). Now I am 35k so at least I’m fixing the issue before it really hurts me like Mahrez did for him. Salah will keep his place, he has fantastic stats and has the biggest threat stats so far across all midfielders. I still have faith in him that he will score very big this season (I hope big explosion is coming in GW 9+10). For now he is outside my team as I want to gain an extra £0.2m. That’s £0.1m by not owning him for his inevitable price drop to £11.7m and I hope I can gain another £0.1m from selling Siggy. I brought him yesterday for £7.3m, now he is £7.4m. I’m hoping he will be £7.5m by GW9. Richarlison is a banker in my team and nothing needed more to say, for me he is a premium player and worth way more than his price. Fraser is coming in at £6.0m instead of Maddison, as I think he will over perform Maddison in an explosive Bournemouth team (although they have tougher games than Leicester). My benchwarmer will be Højbjerg, who I think is the best £4.5m player. Kun is still the best striker in the game, with a very strong home games in GW 9 & 11 (best candidate for the armband in those weeks), so he keeps is place. I just hope he can get more than his regular 60 minutes. Wilson gets the second spot due to amazing form and returns (also plays almost 90 minutes every game), and last spot goes for Jiménez, whom I hope is not a downgrade from Mitrovic. I like Mitrovic alot but he’s playing for a team in terrible form. Jiménez returned in 4 consecutive matches and I hope he can keep it like that. He does have good underlying stats, and he is ranked 2nd in the creativity index and 8th in the threat index for the FPL. In this option I am trying to fit Mendy in to my team as he is fit again and will be massive force in the City defence. I consider him as one of the best 3 defenders in the game alongside Trippier and Alonso. So it is Mendy for Lovren, and to get him I need to squeeze elsewhere a little more than I wanted to get 3 playing strikers and 4 good playing midfielders. So in this option I downgrade Ederson to Leno which is good way into Arsenal defence. Instead of Højbjerg I get Masuaku to fit in exactly in my budget. Two problems I have here, first is “what if” Leno can’t hold his place, so if I want I can downgrade Jonny to Bennett and get £4.4m keeper which could could be Lössl. He has good fixtures when Arsenal have tough ones. There is a possibility I can keep Ederson , but I need to get a £4.3m non playing mid and a £3.9m defender (maybe Bednarek can get minutes) and hope to gain £0.2m from Siggi to Salah move. In here I am trying to fit in my team the best form striker in the game right now with a decent price of £9.6m playing as a CF. Unfortunately it comes with sacrifices from the first balanced option. There are 4 sacrifices in fact. 1- Alonso to Luiz, who is nailed is Chelsea starting lineup but will bring less points in the long term. 2- Jonny to Bennett, that one I can suffer as I already have Doherty. 3- 2 playing strikers instead of 3 (it is what it is, Laca and Success for Wilson and Jiménez). 4- 4.3 or 4.4 midfielder for Højbjerg. I am more concerned about 1 and 3. I would love to get your thoughts in the comments section below and votes in the poll below. This is a very important time for my team in this season and I hope I can climb into the top 10k with this WC. Thanks Yaniv, useful advice. I’ll look out for the posting. Ok. I look forward to see it. Will you make a new article for it? Hi Dave, I will try to post tomorrow my final team in the last contributors article or here, Tnx and good luck!